Abortion advocates like Keenan must be uneasy with the “so-many-so-young” trend. 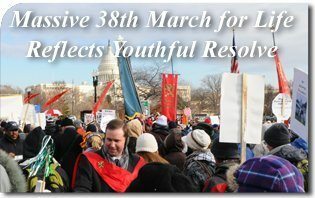 However, as leaders of the pro-abortion movement get older and focus on retirement, the pro-life movement is ever more youthful, numerous and vibrant. And nowhere is the resilience and vitality of the pro-life movement more apparent than at the annual March for Life, where hundreds of thousands of Americans stand against the slaughter of the unborn. On Monday morning, January 24, busload after busload of pro-lifers rolled into the Capitol eager to peacefully oppose abortion and roll back the culture of death. Bishops, priests and religious were also there as parishes and schools came to protest the slaughter of the innocents. 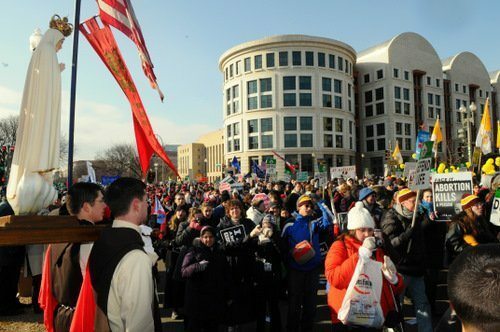 Over 300,000 pro-life marchers filled Constitution Avenue on their way to the United States Supreme Court. As the march proceeded up Constitution Ave., its sheer size was massive. The crowd–estimated at 300,000–filled the width of the avenue from side to side and stretched into the horizon as far as the eye could see. What a sight. Why don’t the major media networks give this any real attention? 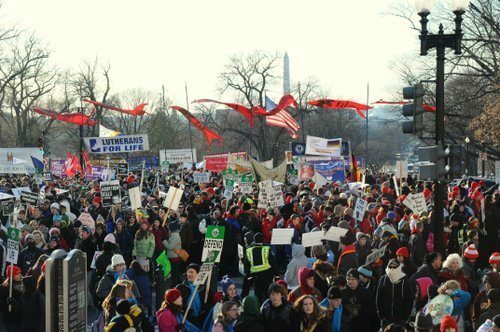 The reason is simple: Like a barometer, the march indicates that the pro-life movement is alive and well. The liberal media would rather ignore this fact. But marchers brave the cold not for media attention but to make reparation before the throne of God for the sin of abortion. Many recite the rosary. Banners and signs fill the esplanade. 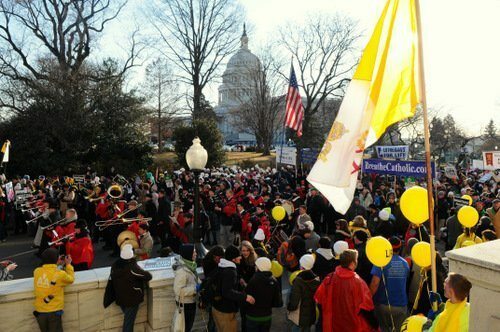 The event, so ably organized by March for Life president Nellie Gray, also brings together a veritable who’s who in pro-life America with cardinals and bishops, senators and congressmen. in the huge crowd prayed the rosary and would reverently make the sign of the cross as they passed. A TFP honor guard wearing the TFP ceremonial habit escorted the pilgrim statue of Our Lady of Fatima. The student body of St. Louis de Montfort Academy of Herndon, Penn. was also present, and The American TFP was pleased to receive contingents from organizations in Italy (Voglio Vivere), Germany (SOS Leben), and France (Droit de Naitre). As in past marches, the TFP’s Holy Choirs of Angels marching band played a selection of patriotic hymns and American marches. The ensemble included brass, fifes, drums and bagpipes, which were greatly appreciated by the passing crowds. Before the march, students gathered at the TFP headquarters for a two-day conference on the leadership role of Catholic men. The seminar was honored by the presence of Prince Bertrand of Orleans-Braganza, a direct descendant of two crusader kings, St. Louis IX of France and St. Ferdinand III of Castile. This year also marks the first Louisiana Life March which gathered over 3,000 people who marched to the steps of the State Capitol in Baton Rouge. 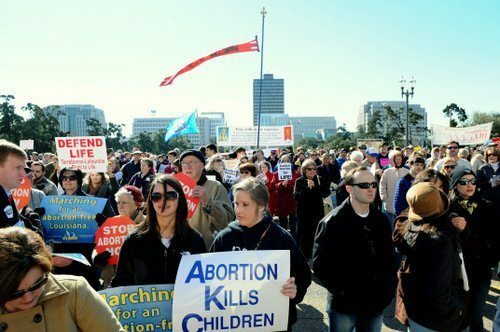 The March for Life in Washington is the largest of many similar events held nationwide to protest the tragic anniversary of Roe v. Wade. For the seventh consecutive year, the Walk for Life in California has been gaining momentum. An estimated 45,000 participants attended this year. While many TFP Supporters, led by TFP member Philip Calder, joined this West Coast rally, for the first time, a Louisiana Life March also kicked off in Baton Rouge on January 22, which members of TFP—Louisiana were happy to support. 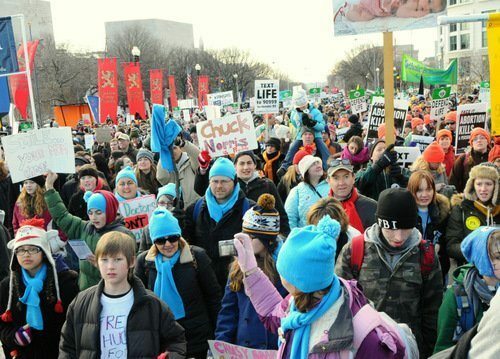 For the last 38 years, the pro-life movement has organized, protested and prayed. It has challenged the pro-abortion movement and put it on the defensive. What is needed now is confident public action to finish the task at hand. This entry was posted in Events of 2011 and tagged 2011, Academy, Action, America, American, angels, anniversary, anti-abortion, babies, bagpipes, banners, Baton, Bertrand, bishops, brass, busload, California, capitol, ceremonial, children, Choirs, Coast, conference, confidence, crowds, Crusader, culture, DC, de, Defense, dictatorship, Droit, Drums, ensemble, equality, Family, Fatima, fifes, France, friends, Germany, guard, Gustavo, habit, Heart, Herndon, holy, honor, hundreds, hymns, Immaculate, insistence, Italy, January, kings, Lady, Leben, lecture, liberal, life, Louis, Louisiana, march, marches, Media, members, Montfort, movement, Naitre, nationwide, needs, Newsweek, old, Orleans-Braganza, Our, parents, patriotic, peaceful, Pennsylvania, pilgrim, priests, Prince, pro-life, Property, Roe, Rouge, Saint, society, Solimeo, SOS, statement, statue, Student, students, supporters, TFP, TFP Louisiana, thousands, Tradition, Triumph, v, Vivere, Voglio, volunteers, Wade, walk, Washington, west, young, youth by Thomas Schneider. Bookmark the permalink.